Texas' large coastline means that the state's landscape includes many beaches. Numerous Texas cities allow weddings and wedding receptions to occur on their beaches. The City of Galveston, located on an island about 40 miles south of Houston, allows weddings on any of its numerous beaches. Galveston beach weddings are on the Gulf of Mexico and most are within walking distance to local restaurants, bars, and other Texas attractions. Beaches under the purview of the Board include the Seawall Beaches, East Beach, and Stewart Beach, among others. You must obtain prior approval from the Board's special events coordinator to host a wedding on one of these beaches or to rope off an area for your wedding. Approval extends to your ceremony and reception. Fees vary depending on the specific site you select, starting around $250. You are required to hire local police officers for your event. Parking fees are $15 per car but can be paid prior to the wedding. While the city used to manage their own beaches, all public beaches are now managed by the Board of Trustees and the city will direct you there for any questions. The beaches on South Padre Island are part of one of the longest barrier islands in the world. Its beaches are some of the widest in Texas and draw a huge Spring Break crowd. Hosting a wedding on the beach requires a permit from the City. However, the permit does not allow you to exclude other beachgoers from the beach. The cost of the permit depends on other elements of your wedding, such as sound amplification. Information about how to acquire a permit and what the permit includes, meaning reception space as well as ceremony space, and the cost of the permit can be obtained from South Padre's City Hall. The beaches of Port Aransas, which are bordered by the Gulf of Mexico, are reportedly very clean, large, and easy to access as noted by reviewers on TripAdvisor. A permit is required for weddings on Port Aransas beaches. Permits can be acquired from the City's Parks and Recreation Department. Beaches in Corpus Christi are managed by the City and are bordered by the Gulf of Mexico. You do not need to obtain a Special Events Application, but you do need to set a special events planning appointment with the Corpus Christi Parks and Recreation Department. They will determine specifics, such as cost and any other special permits needed. Your reception can be held on the beach, in one of the city's public parks, or in a pavilion. The cost will depend on whether alcohol will be served, the amount of insurance you purchase, and any facilities, such as a pavilion, that you rent. Rockport Beach is located in the City of Rockport on the Aransas Bay. Rockport is a fishing village and so its beaches offer casual and calm backdrop for your big day. In addition to having a wedding on the beach, you can rent one of the beach's 61 pavilions. Reservations are required to use any of the city's public spaces for a wedding and can be acquired through the city's Parks and Leisure Services. Mansion By The Sea is located on a beach in Red Fish Bay, which is near Port Aransas. Your ceremony can be held on the beach and your reception either indoors or on the Mansion's outdoor deck. An on-site wedding coordinator helps couples plan their perfect day. San Louis Resort is located in Galveston. Couples wanting to marry on a beach can do so on the resort's gazebo that overlooks the beach. A reception can be held in one of the hotel's many indoor and outdoor spaces. An on-site coordinator helps couples plan their wedding. Pearl South Padre is located on the southern end of South Padre island. Ceremonies can be held on the beaches right outside the hotel's door, while receptions can be held in one of the hotel's ballrooms. Plantation Suites and Conference Center is located in Port Aransas and offers wedding packages to couples looking to marry on the beach. Receptions can be held in one of the hotel's conference spaces. Beauty and the Beach features a lighthouse with a beachfront wedding pavilion. It was built specifically for hosting weddings and has many amenities included in their packages. Two Doves in the Sand is located in Corpus Christi. It offers multiple packages ranging in cost from $750 upwards of $5,000. Packages may include vendor referrals, budgeting assistance, rehearsal coordination, and management on the day of the wedding. Weddings can be held on any beach of the couple's choice and packages include assistance obtaining required permits. Baroque Events Galveston planners specialize in beach weddings on any of the Galveston's city beaches. The company offers over 15 packages. Get a quote based on the number attending and your specific requests by contacting them. A basic pop-up package for 20 guests with the bare minimum starts at just under $600. A Beach Affair focuses on South Padre beach weddings. They offer affordable packages that start around $500 and up to around $3,000. Each package includes officiants, license, and photography. Weather: Although Texas doesn't experience a frigid winter, temperatures drop in the state in the fall and winter months. Check on the typical temperature in any given month in the city prior to planning a beach wedding to avoid a chilly wedding. Beach cleaning: Some Texas cities clean their beaches on a schedule. If you want a clean beach or to avoid the heavy equipment that is normally parked on the beach during these times, check into the cleaning schedule for the city in which you are planning your wedding. Spring Break crowds: Texas beaches become rife with college-age students during Spring Break. Check with the beach's chamber of commerce to determine the busiest Spring Break times of year to ensure that you avoid the mayhem. Texas culture: Texas is a unique state: its residents are friendly and its pace is calm. Keep the state's culture in mind when planning your wedding. 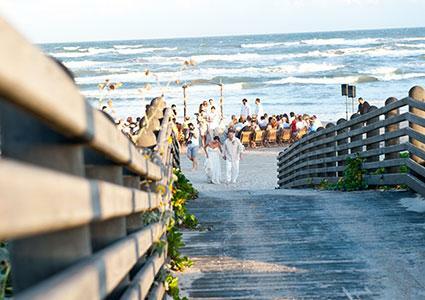 There are dozens of beaches, both public and private, within Texas that may suit your wedding. Most public beaches require a permit. 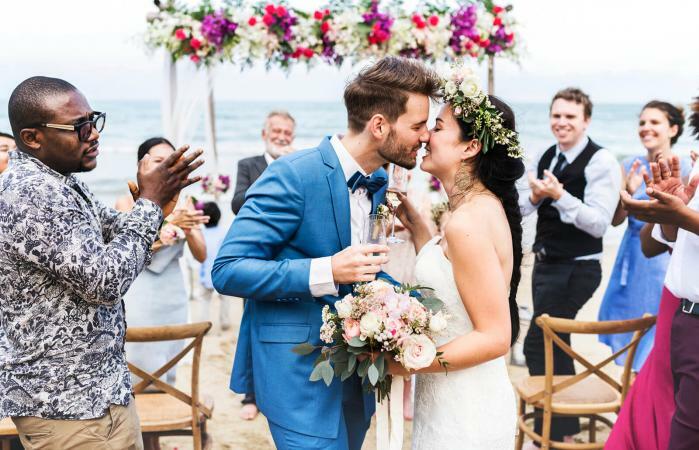 Inquire with the selected city's department of parks and recreation or special events to determine the permit requirements that apply to your beach wedding.